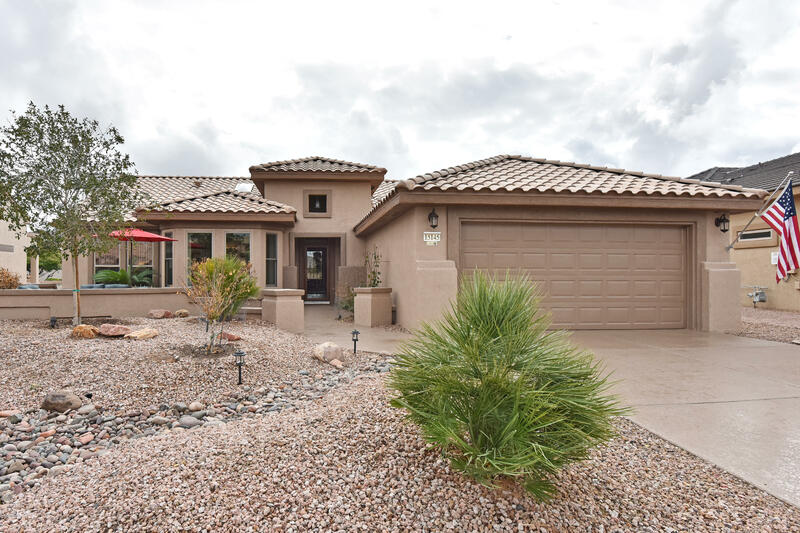 Sun City Grand Palo Verde Model, Transformed To Perfection! Guests Enter Through the Beautiful Front Courtyard Patio With Knee High Wall. Upgraded in Every Detail, 42 Inch Kitchen Cabinets, Slab Granite Counters, Viking Gas Range, Stainless Appliances, Brushed Nickel Hardware, Decorator Paint Colors and New High Energy Efficiency Windows. Large Vinyl Unobstructed Windows Overlook the Supersized Front Courtyard. Master Bedroom Overlooks the Inviting Pool, a Barn Door for Privacy, Two Sinks in Master Bath, Marble in Master Bathroom, Granite in Guest Bathroom, Both Baths Have Under-mount Sinks And Tiled Showers. Whether at The Outdoor Patio, Extended Covered Patio or In the Pool with Its Baja Step, This Private Backyard Is A Party and Play Place!